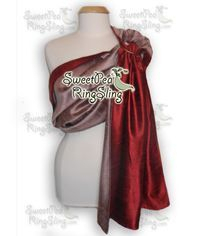 Drape Yourself and Your Baby in Pure Silk Luxury. Great for Special Occasions or Everyday Wear. Silk is a natural fiber that adjusts to temperature. It is lightweight and breezy in the summer, yet warm in the winter as well! Your silk sling will be double layered and is very strong. 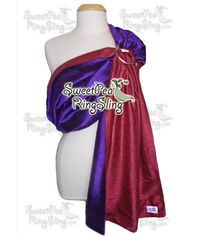 The fabric is not super slippery and will not slide through the rings once the baby's weight locks it into place. To prolong the life of your silk sling, it is best to spot clean. If you must wash do not use detergent and leave the sling out to air dry. Iron your sling after drying to soften and repress the rails. All fabric is prewashed and preshrunk. They are soft right from the start, no need to "break in". 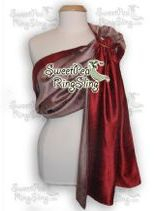 The fabric for silk slings are custom ordered for you from my vendor so there is a 7-10 day wait for your silk ring sling. Approximately 27" Wide. Standard Length is 80" long, however you may change the length for no extra charge. 100% Visually Reversible. You chose one or two colors. 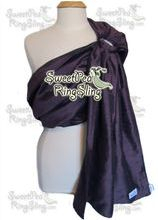 All SweetPea Ring Slings are 100% Visually Reversible. Two different sling looks in one sling. Need white for a wedding or Baptism? Match your bridesmaid dress? More colors available by request. 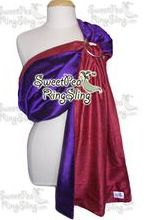 Silk Slings will be made to be apprx. 80" long. If you need it longer or shorter, please indicate that when you checkout. Silk: Add a Zippered Pocket? 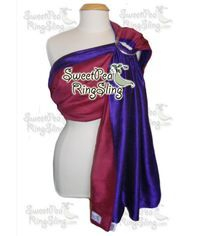 Because of the cost of silk and the custom colors, dupioni slings are not returnable. Please email me for information on how to pay by check or money order. Pick two for your sling! Scroll below to see how your colors will look next to each other. See your colors next to each other. Rich wine red, like a burgundy. Bright with red and purple threads. Bright, hot pink or fushia. A dustier pink, like a mauve. Russet orange, a brick red. Dark Teal with red threads. Mint Green, bright like a speariment. Bright and happy! Yellow with orange interlaced. A blue that is more purple and gray. Purple with royal blue threads. Light purple with black interlaced. Bright fushia interlaced with black. Deep, majestic eggplant. A red purple. Lavender, lilac, a light purple. Copperish pink, like a penny. Cream with a hint of pink. Caramel, khaki, latte. A nice neutral color. 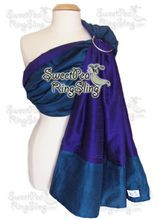 Dupioni Silk is normally made of at least two different color strands. That is why the color looks different in different lights or different photos. It even changes as you move. 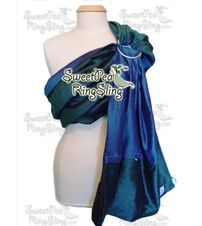 Silk slings are often made for special occasions and/or to match something. So the colors below may not be listed above in the options. But I can reorder the shades below. If you need a different color, send me an email. If you see a color below that you'd like, just indicate that choice when you checkout. 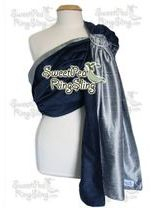 Gray/Ice Blue Dupioni Silk with added pocket and requested reverse tail. 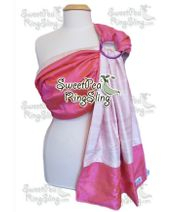 Champagne/Rose Pink Dupioni Silk with added Pocket in the same lining color. 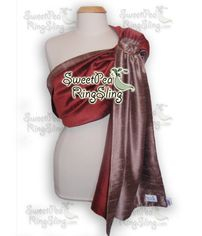 Chocolate Brown/Gold Dupioni Silk with added Pocket in the same lining color. 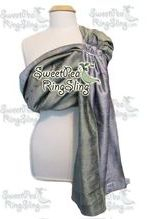 Silk slings are often made for special occasions and/or to match something. So the colors below may not be listed above in the options. But I can reorder the shades below. If you need a different color, send me an email. So if you see a color below that you'd like, just indicate that choice when you checkout. You can also do a Cotton Print on one side and the Dupioni Silk on the other side, on the Premium Silk page. 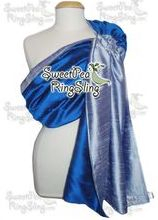 You can design a custom silk ring sling with stripes on the tail, prints on the tail, vertical stripes, etc. See the photos for more ideas! Stripe on the tail are $6 per stripe, per side. Vertical Stripes (four colors of silk) are $200. Silk with printed cotton on each side of the tail are $120. Add a Doll Sling to your Order. 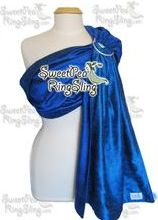 You can also add a matching Silk Doll Sling to match your adult Silk Sling for $27. Send me a message below to add this.